The first Q&A in the DRMCCA internship series is with Giordano, currently interning with the Tsunami and Disaster Mitigation Research Center (TDMRC) in Banda Aceh, Indonesia. 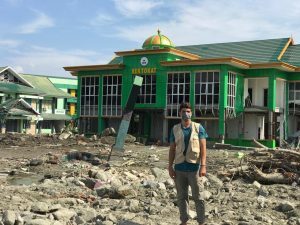 Read more about the work he’s been doing, and about his unique experience working in the direct aftermath of disaster. Hey! My name is Giordano Margaglio, I am 23 years old and I am from Rome, Italy! More than one year ago I started an amazing journey in Lund with the MSc in DRR & CCA, and now I am about to complete the third semester of the programme. So far this has been an amazing experience. At the moment I find myself in Banda Aceh, a city in the north of Sumatra, Indonesia. I arrived here two months ago, and I am going to stay until early December for an internship at the Tsunami and Disaster Mitigation Research Center (TDMRC). In 2004, due to the terrible Indian Ocean tsunami, both the city and the region suffered an impressive amount of destruction and fatalities, which ranked Aceh as the most affected area from the disaster. For this reason, a number of professionals and scholars from the field gathered and decided to give birth to TDMRC, in order to raise awareness about the potential damages of natural hazards, make research in vulnerable areas, and enhance the resilience of a region which, due to its geographical position and proximity to the Ring of Fire, is very much exposed to many types of adverse geophysical events. As an intern, I get to work in many of the projects ongoing within the organization, ranging from international workshops and seminars to local field trips and community activities. More specifically, I work with the Tsunami Mitigation cluster, whose focus is to devise strategies and measures to withstand this type of natural hazard. So far my internship has been great! To be honest before my arrival I did not know what to expect from this experience, as I was the first intern TDMRC ever received. However, as we started cooperating in the different activities, we found a great balance and harmony in every working situation. One of the things I enjoy the most is the fact of not having any “fixed commitments”, therefore each week I speak with my supervisor and decide together the tasks I am going to complete over the following timeframe. This gives freshness, versatility and flexibility to my experience, and additionally I get to learn many different things instead of just one. I can never get bored! So far, the most valuable moment has definitely been my field trip to Palu. Last September 28th, a terrible earthquake and tsunami struck Sulawesi Island, in central Indonesia, and in particular the cities of Palu and Donggala. TDMRC decided to send a team to assess the damages of the impact and collect valuable data for future research. At the beginning I was not allowed to join the team, given the difficulties of bringing a foreign intern in an affected area, as well as the governmental permits for conducting such type of research. However I really pushed for it, and eventually I managed to fly there two weeks after the event. 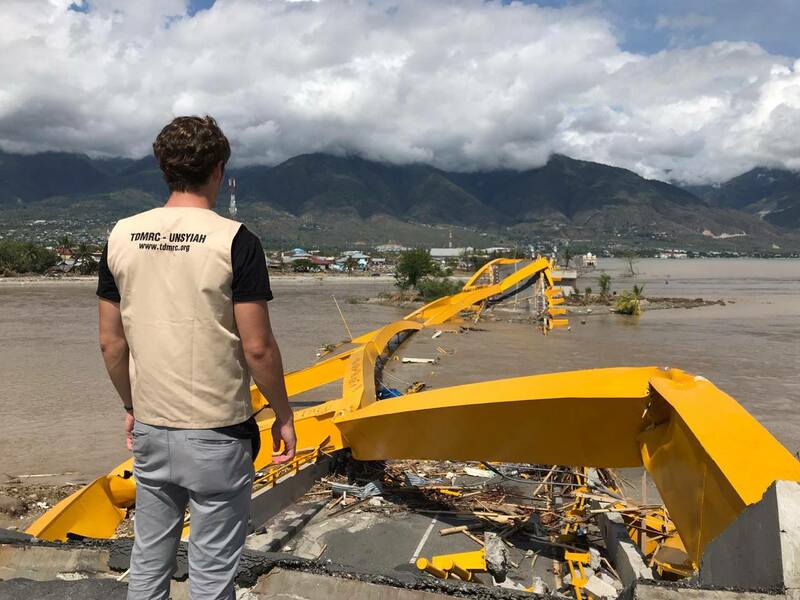 In Palu, we spent one week performing field assessments, conducting in-depth interviews with the local community, analyzing the types of sediments left by the wave, drone mapping the affected areas and assessing structural damages to the critical infrastructures. Honestly, I believe this has been one of the most enriching experiences of my life. The very fact of witnessing first hand such level of destruction, speaking to the local households, and bringing my knowledge and expertise on the field, made me learn much more than many years on the books. Frankly speaking, as much as I love travelling and living in different contexts, the adaptation process in Aceh has not been as smooth as in my past experiences. This was mainly due to the very high degree of cultural difference of the region with the rest of the world. Aceh, indeed, is considered as a quite radical place in terms of religion and Islam, as Sharia is acknowledged as the first law. This prioritization raises a series of rules to respect and things to get used to, such as – for instance – the closing of every shop five times a day or the full coverage of certain parts of the body. However, after some time I got used to these little things, and now I fully appreciate and make the most out of this great cultural difference. Do you see this internship fitting in with your DRMCCA studies or future professional ambitions? How so? I truly believe this internship has been a critical step in my educational process. Ever since I started, I continuously encounter concepts or tools which we have been discussing in class over the past year, and I get to apply them in a practical and useful context. At the same time, I am discovering many other notions and mechanisms underpinning the DRM world, and I am sure they will be very useful as soon as I’ll start my professional career. Additionally, over the past two months I met a number of practitioners, professionals and researchers in the field with whom I had a chance to discuss and connect with. I believe networks are one of the most critical things in life to realize any aspiration. Now, thanks to this internship, I have one as well. To conclude, I just would like to say that before getting to Indonesia I was supposed to conduct my internship somewhere else in the world, but that opportunity ended up falling through and not working out. I thought this would represent a great downside for my education in Lund, and that I was going to settle for something below my ambitions. As it turns out, this has been one of the greatest experiences of my entire life, and I could have not have learned as much anywhere else in the world. Therefore, for all of you who will live a moment of struggle during your internship quest – and trust me, that moment will come – just be as open and flexible as you can to any possibility or opportunity you get. The path you will the take will always be the right one for you. This entry was posted in Studies and tagged disaster, DRMCCA, earthquake, earthquakes, Giordano, Indonesia, Internship, internships, tsunami, tsunamis. Bookmark the permalink.